Pablo Picasso 1881-1973. The greatest painter and most innovative sculptor of the twentieth century, Pablo Picasso was also its foremost printer. His graphic oeuvre spans more than seven decades, from 1899 to 1972. His published prints total approximately 2000 different images pulled from metal, stone, wood, linoleum and celluloid. His unpublished prints, perhaps 200 more, have yet to be exactly counted. Early on, the copperplate, with its variants of the etching and dry point, fascinated the young artist. In the Parisian ateliers of the masters of this craft, Eugene Delatre, Louis Fort and above all, Roger Lacouriere, he was introduced to many new techniques. Later, Picasso acquired his own press on which he made many trial proofs and further explored the secrets of printmaking. In 1939, on the eve of the Second World War, Picasso carved his first linoleum cut. The work was the artist’s contribution to the hastily assembled album of poems and prints Pour la Tchecoslovaquie: Homage a un pays martyr” published to commemorate Czechoslovakian martyrs. Its style is quick and curvilinear. Its violent image, the head of an anguished screaming woman, was printed in black and white. It may be considered Picasso’s final postscript to his mural Guernica (1937), and until 1951 Picasso could look back on some 300 etchings and engravings that he had produced over the previous thirty five years. His achievement in intaglio had been extraordinary and it alone could assure his pre-eminence in the history of printmaking. 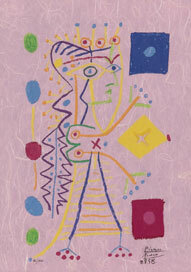 The year 1945 marks the inception of his great lithographic work in the atelier of Fernand Mourlot. It seems almost as though he was now eager to make up for lost time. His growing mastery of the medium and his inventive genius soon enabled him to venture into domains new to lithography and to achieve bold and striking effects. 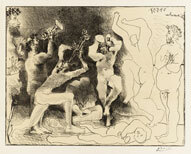 After World War II, Picasso’s production as a printmaker substantially increased and etching and engraving continued to be his favorite medium for graphic expression. During several concentrated spans of time, however, he was profoundly involved with two other techniques: first lithography on stone, (and its surrogate, zinc) and subsequently, linocut, a relief method of carving and printing similar to woodcut but utilizing a linoleum instead of a wood surface. Picasso adapted the processes of both lithography and linocut to his own language and to his individual methods as a peintre-graveur. His continual inventiveness sometimes challenged his collaborators, the printers, to the limits of their own skills as craftsmen. Picasso’s prolific and astonishing example in lithography during the late 1940s and the 1950s encouraged other principal painters of the École de Paris, including Léger and Miró, to work directly on stone and zinc in association with printers. Two women, Franoise Gilot, a painter and writer when Picasso met in 1943, and Jacqueline Roque, whom he met in 1953 (and who would become his second wife in 1961) were the primary sources of inspiration in his subject matter for his lithographic output. In 1951, when Picasso was seventy, he renewed his interest in the art of linocut, an interest which would continue for almost two decades. In 1963 Piero and Aldo Crommelynck brought a hand press from Paris to Mougins, where the artist had settled permanently. From then on, his etching, dry point and aquatint would translate into black and white on colour compositions of unfailing inspiration. In his eighties, Picasso actively resumed etching and engraving and about 500 intaglio plates from this period of his career have been published. Finally, in 1972, a year before his death, Picasso etched two intaglio plates, his last prints. 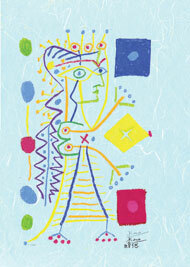 Picasso has astonished the ablest printmakers again and again. It is not only that he mastered the difficulties of new techniques with playful ease; he soon went on to obtain results that had hitherto been deemed impossible. A virtuoso craftsman in engraving, etching, lithography and linocut, he explored their secrets with patience and love and elicits from each medium the very subtlest effects the medium allows. It is hardly surprising that five, ten or even thirty states were sometimes necessary before a masterpiece emerged from his hands.